When I was 11 years old the only thing I knew of or cared about God was the word itself. I knew He was important, “God” was a big deal, but had no inkling of more. I was 11! In Boy Scouts we sang a song that would later have a profound effect on my life. I can still sing it to this day – verbatim. My life priorities in 1970 were 1) being acceptably popular, staying unnoticed at age 11 is a good thing. 2) girls – especially Lisa from a distance, 3) football, and 4) Boy Scouts. I loved Scouts. We did cool things, and I had a Dad that participated with me (a little too much in my opinion). To his credit I think he tried to keep a distance and tried to let me have a parent-less experience. We camped, went on canoe trips, hiked in the woods, caught snakes, started fires and shot guns. What more could a kid want? In Scouting at the time, they weren't ashamed to say the word God. After all, it’s still part of our nation isn't it? - In God We Trust and all. It was the 1970’s and things were different then. Mentioning God was acceptable in public. On my honor, I'll do my best, to do my duty to God. On my honor, I'll do my best, to serve my country as I may. To keep my body strengthened and keep my mind awakened. To follow paths of righteousness. When I now think of the song I can see plainly it contains the principles of Commitment, Discipleship, Patriotism, Service to Humanity, Personal Physical and Mental Health responsibility. I’m sure a person could also attach other attributes, but I won’t here. These are enough. To this day, even though I may not live this song to its fullest, I certainly know and own the values of the song and do my best to uphold them. I hope it is continuing in the Boy Scout program. 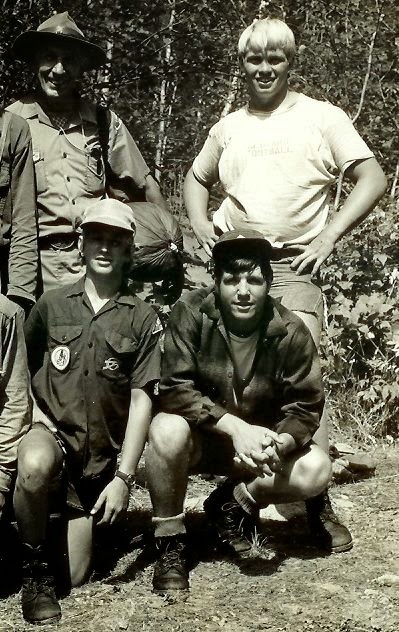 The photo above is when we went as a troop to Charles L. Sommers Wilderness Canoe Base for three weeks. I'm not quite 11 years old there, but we were still singing the Scout Hymn, "On My Honor". I'd like to give a special tribute to David Sturdivant who was my best friend and passed away a few years ago. I hope you'll share this with a friend. Gus, this is a powerful piece on commitment, love, devotion and honor. Thank you for your amazing blog!